I got interested in heels quite a while ago and i never had a chance to take them out. I only wore them inside when nobody was there to see me. Last year I have travelled to England to study there but after a year I have returned to take a break from studying. Back on topic tho. I did wear heels there but I never had the confidence to take them to school or anything along those lines. This year I finally forced myself to change that. 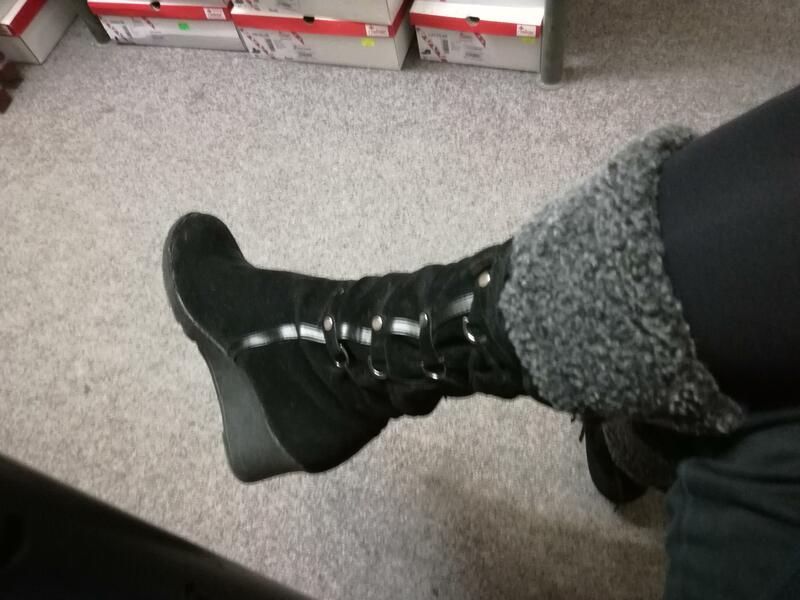 I went out on saturday to work in heels (seen below) and stayed in them the entire day. To be honest it was only for 3 hours and I was alone there (working at a shoe shop) so it wasn't that scary but I was so excited that I walked in them all the way to work and back. I have to say that I always said to myself that people do not care but you never actually believe it untill you go out. Nobody noticed who cared enough to say something and people that did notice did not say anything. 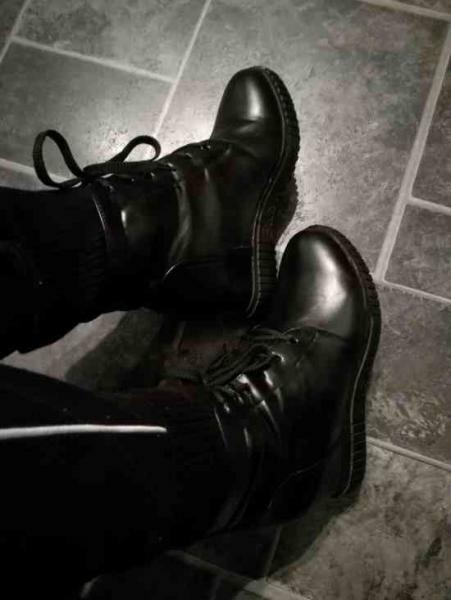 I am so happy that through this I gained the courage to go out in them. I will keep you updated at what is happening but it will not be too often. (have only 1 from 3 saturdays in a row). In all seriousness, men sales associates wearing heels in the shoe store will progress the fashion trend more than others. It happened to me, I did not even think about buying high heels until I saw a male sales associate walking around in some tall block heels at Nordstrom. I believe Krystof said he was studying in the U.K. but returned home for a break. 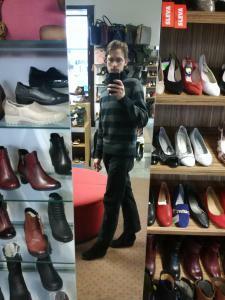 Since he is based in the Czech Republic I am assuming he is working in a shoe store in his home country while taking a break from studying. Although I did wear heels into the store I only did it cause I was there alone with no other workmates. (I do not think their reaction would be the best but if I ever get a chance to change that I will try it.) Otherwise I just wear normal shoes. I do plan from October when my university should start only going out in heels. 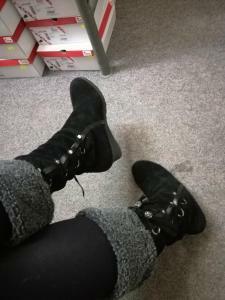 Need to find some that are not so warm for the autumm but it is a plan of mine that I am sticking to. However I do love working in a shop likes this as I was able to find my correct size, try on some stuff and so on. (all done when I was alone) and I did find a few that I wanted but we did not have the right size :-(. I would love to inspire people to wear more heels. And to the question why have I not done it sooner? Well did not have anything to walk in back here in czech republic. It is hard to find eu 42 size and even harder to find 43. I need 43 closed and I can have 42 but only sandals. If I would be able to get some more I will do so real fast :-). And yes I am currently in Czech Republic. I may move to england I may not. Depends mostly on my potentional S.O. As I am writing this I am wearing the wedges at home. Keep up the good heeling lads. I bet your workmates will be relatively opened minded to wearing heels. At least they will be when you start to get more sales than they do, to men who come in buying heels from you! Good work, mate! You should be very proud of yourself. That first step out in public is the most difficult. It gets easier each time after that. If I were in your country, I would make a special trip to your store to buy shoes from you. You're doing the right thing, and you will be successful! Good luck! well done @Krystof - good for you, I know how much courage you must have needed for this! 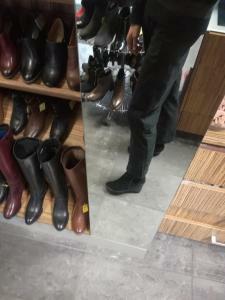 These boots look really great on you... I really like the style, they look so cosy. am wearing them with tights am sure just makes them even more pleasurable to wear, right? 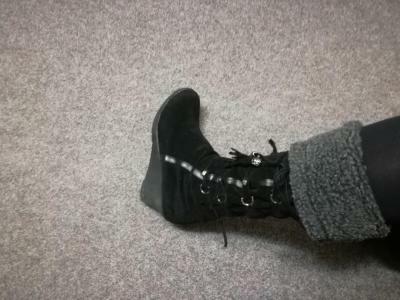 Where did you get these wedge boots from? and wow - working in a shoe shop - wow, that's probably a dream of most folks here!! Maybe you can make a special order for larger sizes? As others have said, I assume your fellow associates at the store would not be off-put by you wearing heels... especially if they are as tasteful as these. You are off to a great start for sure, just remember to proceed slowly, your confidence will build with every step. Trying to overdo it with heels that are too high, or in a tricky situation, can be a big set back to your confidence. Congratulations, Krystof! The very first time in public wearing heels is always the hardest, I can guarantee you it will only become easier with time. Enjoy your experiences! I wear tights as it looks better and goes well with heels. Also I use it as a cover too. 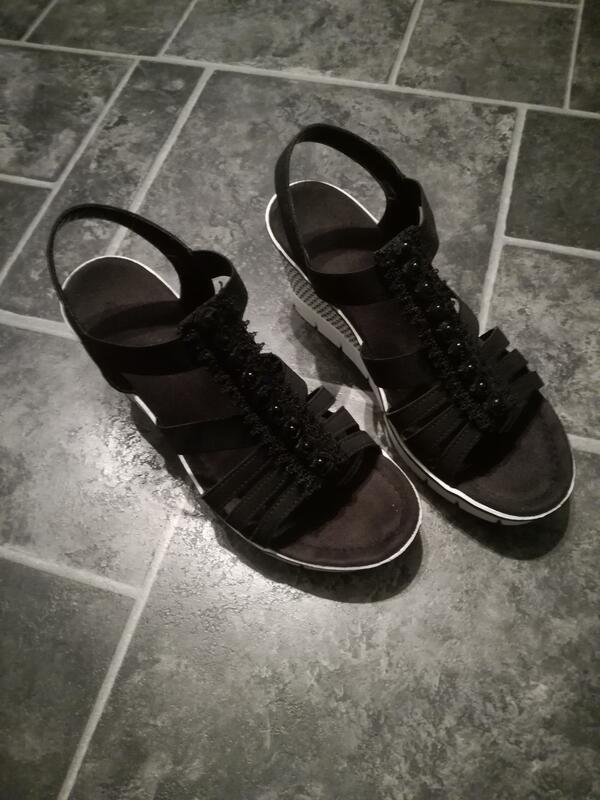 I got these wedged shoes from czech e-shop called "pošta zdarma". Sadly enough I doubt I will ever make us get bigger then eu 42 sizes. Also I am slightly scared saying or showing anything to my workmates as they are conservative and unless I get to somehow get to it by random activity I will not be wearing heels with me not being alone here. And yes - I understand your worries. I am in a similar place too. So for now, enjoy it when you can, and wait to see if a relevant time/place comes by where you think it might work. Hello everyone, sorry for the small delay, had other things on my mind. I did decide to go to work in the wedges seen at the beggining on saturday again. This time however our new member was with me and she did not even noticed the fact i am taller. It felt so good to be in heels the entire time and people not even paying attention to it. I am starting to get used to not carring at all even if they do notice. That is a nice improvement if i say so myself. This saturday i have a lesson from school for learning on enter exams for uni. I might get my new wedges on Friday but if I do not have them I will wear them ones at the top. So excited about this. Well done @Krystof - sounds like a success! Keep enjoying... and keep us posted! I have been to the practice lessons for the uni entrance exams. And it was with the wedges that are up there. Still waiting for my new pair of sneakers, too excited. I also did get new wedged sandals for home shoes purpose and I will get a foto of them once I get home. However about my time out. Well I do not think anything interesting happened. Nobody noticed or paid attention as far as being out loud goes. I think most of them (there was 16) of us noticed at some point but nothing said. We did however had an interesting experience getting into the building. They have a door that can only be opened by card or by ring (where you ring someone and they can open the door). Yet the ring was not working and nobody had a card that could open it. So like 8 of us was stuck in front of the door waiting. Our lecturer did walk downstairs to get us in the end but it did take a while. In the end I enjoyed my time in heels and I know that I will be sticking to it for the entire uni. Also I think that thanks to heels I will learn to walk with my back straight. Still unsure what to do during the summer as I am not completely confident going out in sandals yet. Also what are your tips about shaving legs and so. I know I should do it if I want to be ever wearing heels with shorter trousers or shorts (skirt and dresses). I just can not make myself to do it. 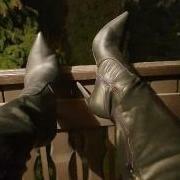 Hi @Krystof, I liked Your adventure and first steps in heels. It looks like you're having fun in them :). For shaving your legs I recommend for first time using classic razor and then using sticking plasters with wax on them. This way You should have smooth legs even for 2-3 weeks. And then just regularly use those wax plasters. What part of Czech are You ? I have like 30 km to Ostrava from Poland and my place. Wow, good for you @Krystof, that's great you were able to happily "go public" with your wedges boots. 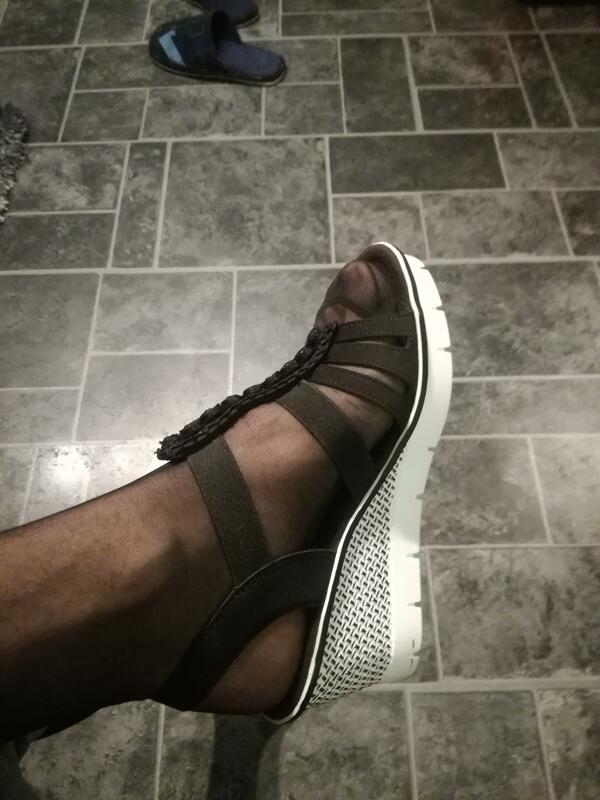 They really look great on you and am sure they don't attract too much attention. Keep it up! If you are already thinking about wearing shorts and sandals, you will probably go ahead and do it at some point. 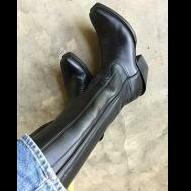 I was the same as you--I started out with little, not really noticeable heels, and just gradually got more confident and less caring about other people's reaction to me. I still don't wear skirts or dresses, but I do wear shorts with heels all the time in the summer. It's a look I've always liked, and lucky for me, it's become a much more acceptable look than it used to be. I have always just used a regular razor to shave my legs(keep it separate from the one you use for your face, though), with some of that extra-slick shaving cream I'm sure you can find most anywhere. Hi @WenHH for sure I am. Thanks for the tip I will remember it for the future, most likely will not go for dresses/skirts untill I live alone but its good to know what other people do. Does it hurt a lot or is it another one of those myths same as that heels hurt like hell? Which is very wrong. I live in Úvaly which is located just east of Prague. Sadly quite the distance between us. I am quite intrigued into dresses as I absolutely love coats and dresses are the closest to that for other then winter times. Also not a big fan of trousers period :-(. Dresses look so much better. Hope that world would decide its better to let man dress however they wont without judging them. I guess the heels are closing in on that. 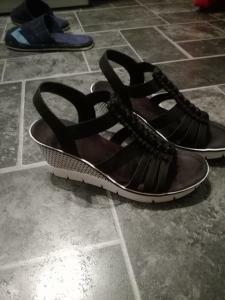 I am back again so as I said today earlier, these wedges sandals I am wearing at home every day. 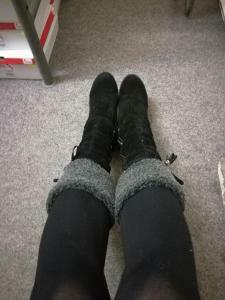 Right now it is with stockings due to cold weather but during summer I think I will wear then on skin. @KrystofI waxed my legs without shaving them so it was painfull as hell. Also my girlfriend did it on my legs. She enjoyed it too much that I was in such pain. It hurts for 5 10 seconds max. So if You aren't ashame to wax Your legs go to a professional. Remember that men do that. Swimmers are great example. So just make appointment and go :). Feeling of stockings with freshly waxed legs are too good to pass it out. In my opinion wearing sandals/pumps with a skirt/dress needs smooth legs. 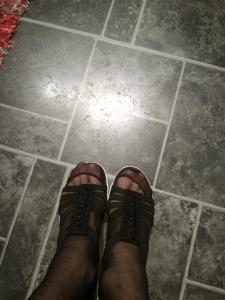 Open toes require a pedicure, although open toes in a work environment are often a bit of a no no, I wear pumps to work, but would never be allowed to wear some of my peeps, or mules etc to work. As a full time heel wearer I feel that showing my toes is definitely sort of flirtier than closed toe shoes so I wouldn't do it in a work capacity. I would recommend waxing (shave to approx 5mm length for best results, and then wax, best to get it done professionally because it is much quicker and hurts much less being done to you, rather than doing it yourself. The waxing results last longer than shaving and hair regrowth gets continually finer and continually easier to wax. Shaving makes hair regrowth coarser. If you are going to wear a skirt or a dress regularly like I do, then what I chose was to get IPL/VPL permanent hair removal, where you can shave your legs between treatments (to keep presentable in short term) , each treatment takes a little longer than the waxing treatment, but they are typically 6-8 weeks apart, instead of monthly waxing, and the hair never regrows - after an average of 6 of these IPL/VPLs treatments you will have perfectly hairless legs all the time. No need to have anything done anymore, you can wear a skirt/short shorts etc with bare legs anytime. Whatever you are doing you'll need to exfoliate and then moisturise your legs thoroughly every day. If waxing/shaving this will really help avoid ingrown hairs, and over time it ensures your legs are very smooth and even skin consistency. The trick to showing your legs is having good legs. I found that its easy to wear a shorter dress/skirt once I felt comfortable in my mind that my legs looked ok. Then you find you can work some of the neat fashion hosiery thats out there too ! In my opinion wearing sandals/pumps with a skirt/dress needs smooth legs. 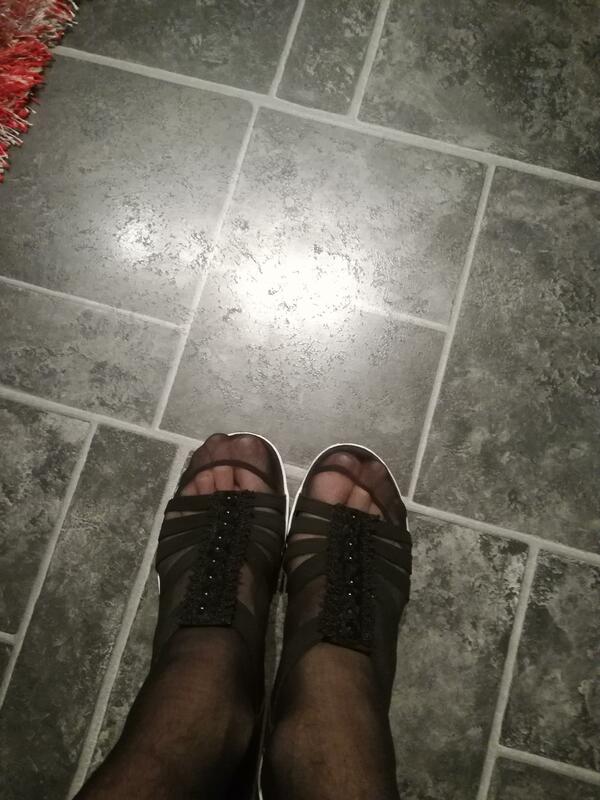 Open toes require a pedicure, although open toes in a work environment are often a bit of a no no, I wear pumps to work, but would never be allowed to wear some of my peeps, or mules etc to work. As a full time heel wearer I feel that sh﻿owing my toes is definitely sort of flirtier than closed toe shoes so I wouldn't do it in a work capacity. Hi @nzfreestyler. Oh my this is so much information. Thank you that is incredibly helpfull for me. Definetly will make sure i read it again once it becomes more relevant. Right now just sticking to heels. I mean as long as I will live with my family. But thank you. Keep up the tips I really appreciate that. as I mentioned I wear heels openly everyday and with skirts/dresses almost always. If you've got any questions etc just ask me. My wedged sneakers I got to wear to school have finally arrived. 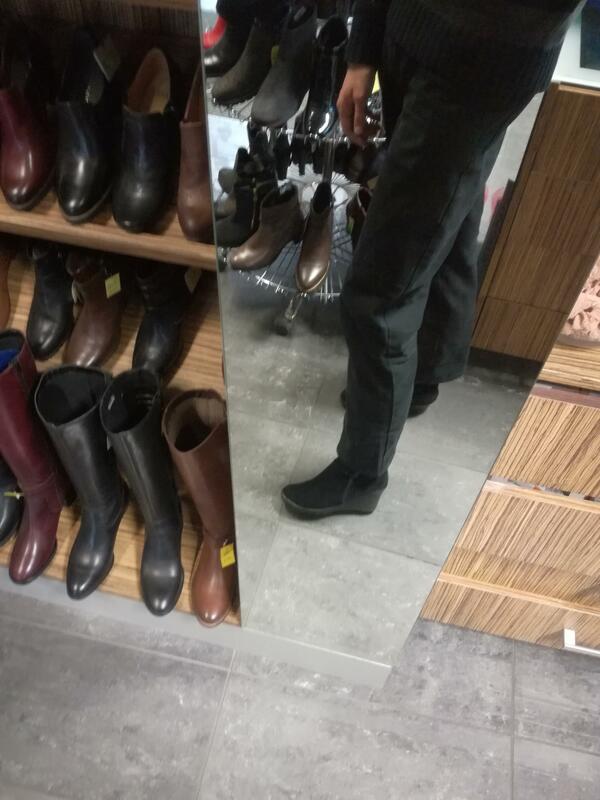 They fit really well and feel amazing to walk in. So excited to take the out this saturday. I even have somewhat cool "leggings" to go with it. Its not exactly that but close enough. Very thin completely black trousers. (Not the ones on photo). I will say more when I return about how it went. So expect some experience on saturday or sunday. Congrats @Krystof. You certainly shouldn't have any issues with these as to can't even see the heel. How high is the heel? Am sure the leggings will go well with them. As you say, do show us the look and tell us how it went. BTW. When you say you can show more, you mean because of the attachment limit?